POOL: The third round of Patong Pool League (PPL), sponsored by Thailand Pool Tables, Genius 2 Garden and Restaurant and Tualek Whisky was played last Thursday (June 14) with Caddy Shack keeping their one-point lead at the top of the league table. Caddy Shack managed to keep their marginal lead at the top of the table following an strong 8-3 home win against Genius Bar. 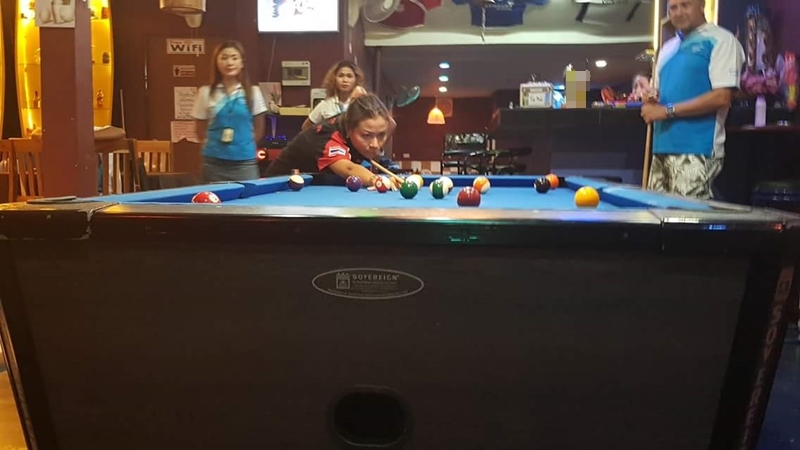 Photos from last Thursday’s game posted on the Patong Friendly Pool League showed that despite the loss, Genius still had a great night at the host’s venue. Elsewhere, Red Light Bar hosted the team from Simon & Oils, the latter of whom have had an impressive start to the new season and appear to have a more competitive team than ever. Tai, Gordon and Thong, all playing for Simon & Oils, won their singles and double matches as did Tony from Red Light. However, Simon & Oils were too strong for their opponents on the night and sealed a comfortable 8-3 win. Ting Tong played away at Wombat, whose players Darren, Kob, Frank, Reed all won their singles and doubles games. Sadly Ting Tong couldn’t get a grip on their opponent and Wombat went home after sealing an easy 9-2 victory. Meanwhile, Kiki Sports Bar hosted Team Kwan (formerly Hole in One Bar) and this was a close-fought match going right until the beerleg. After the third set in the beerleg Team Kwan was finally was able to turn the match in their favour and ended up sealing a good 7-5 win. Last but not least was Natalie Bar playing at home against Happy End who were strengthened by Pi Pom from Martin Swiss and Roy who had just flown in Norway where he plays for the National Pool Team. However, it was evident that Roy was still feeling the effects of jet-lag from his trip and was unable to contribute any points for Happy End. The only player from Happy End who was able to make an impression on the night was Khun Oye who won her singles and doubles game. However, with Natalie, Oh and Napoli all winning their singles and doubles games the end result was a 8-3 victory for Natalie Bar. The fourth round of the Patong Pool League is to be played this Thursday (June 21). Any people interested in playing, as well as visitors, are all welcome to attend at one of the 11 participating bars. You can also visit their Patong Friendly Pool League Facebook page.